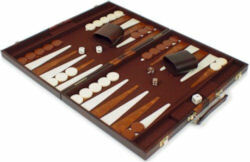 Backgammon is a game of chance and skill for two players, played on a game board marked with twenty-four alternatively-colored triangles, called "points". "outer table". The two halves are separated by a space called the "bar". Each player received fifteen playing pieces (often called "stones" or "men") of opposite colors, which are placed on the game board in a special opening formation (as shown in the illustration). The two players sit opposite from each other. One player uses the light-colored pieces, and the other uses the dark pieces. In the illustration, the dark player's inner table is in the upper left, and the light player's inner table is in the lower left. In the initial configuration, both players start out in equal – in identical formations (180 degrees out of phase with each other). The goal is to be the first to move all your pieces into your inner table, then to remove them from the table. Stones are moved based on the roll of two dice, with each player taking turns casting the dice and moving his pieces. Pieces are moved based on the numbers on the dice. You may apply each dice to a seperate piece, or the total may be used with one piece. If you roll a double, you get twice the points. That is, if you roll a double 6, you can take four sixes, two twelves, one 24, or one 6 and one 18. If your opponent has more than one piece on a particular point, then you can't move there. If your opponent has only one piece on a point, and you happen to land on it, not only can you take the point away from him, but you also get to knock him off the board, and onto the "bar". Once a player has any pieces on the bar, he can't move any of his other pieces until he gets off the bar. The only way to get off the bar is to roll the dice and move back to the start – the opponent's inner table. Once a player has all of his pieces on his own inner board, he can begin removing them from the board (known as "bearing off"). This is done as any other movement – by rolling the dice. A roll of 3-4, for instance, allows you to remove a piece from both the 3 and 4 points (points are numbered starting with 1 at the inner-most position of the inner table). The player who first removes all their pieces from the board wins. If their opponent has not borne off any pieces, the game is worth double (this is known as a "gammon"). If their opponent has not borne off any pieces, and still has any pieces left in the winner's inner table, then the game is worth triple (this is known as a "backgammon"). A further element of strategy involves use of the "doubling cube". Initially, the doubling cube is set to "1", meaning the game is worth one win. Before a player rolls the dice, he may elect to double. At this point, his opponent may either accept the double, or concede the game. If the double is accepted, the game is now worth two wins, and the doubling cube passes to the player who has accepted the challenge. At a later point, he may then challenge the first player to another double. Again, the challenged player may either accept or reject double. The doubles may continue in this way all the way up to 64 (1-2-4-8-16-32-64). This quick overview just scratches the surface. For more detailed rules, as well as discussions of strategy and tips for play, refer to one of the fine backgammon books. Tom Keith has a great backgammon site, and his rules page is extremely well done, with clearly-written text and outstanding illustrations of the backgammon board and player movement. A nicely-illustrated introduction to the game of Backgammon.